Maidmans moving and storage are industry leading professionals, with a reputation for domestic and business moves which is second to none. Often the move from one property to another is delayed sometimes when a new house or office has yet to be completed or refurbished. 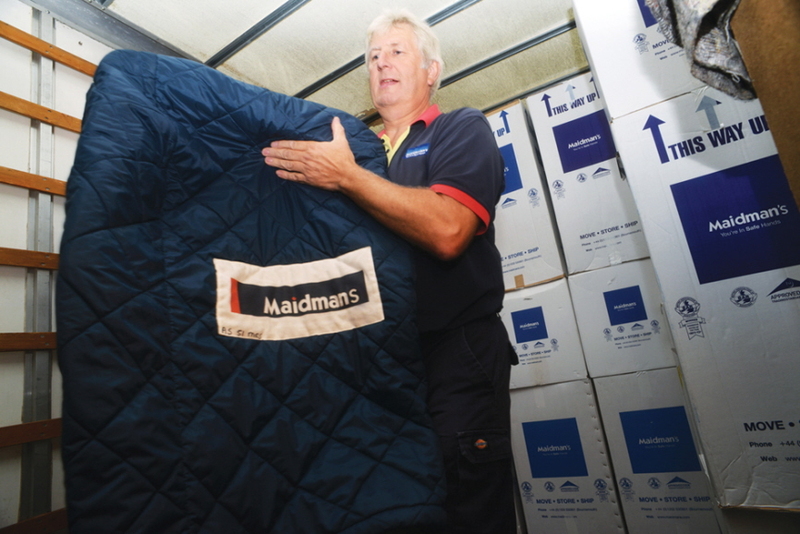 Maidmans storage solutions are rated as highly by clients as the moving side of our business. You may only need short term storage or maybe you would like to free up some space in your home or business premises Maidmans should be your first call. Our secure warehouse is part of a network nationwide of 16 secure warehouses. Should you require storage for documents which you need regular access to we can provide this service. Our secure industry-standard storage containers are approved by the British Association of Removers – 250 cubic ft internal capacity (8ft x 7ft x 5ft external dimensions). The 650 containers in our 14,000 sq ft storage facility save you time and money because our forklifts can load them more quickly and efficiently. Our containers are big enough to cope – just three can handle the contents of an average three-bedroom house. But they’re small enough to transport easily. Our vehicles can each carry up to five containers. Crate hire is a must for a successful and efficient move. You will need solid dependable crates and packing materials. Maidmans crates are light, strong and designed specifically for moving, not just storage, so you can safely transport fragile computers or heavy books. We hire out crates directly from stock, not a third party, so we can vouch for their quality and availability. The efficient document archive and storage offered by Maidmans moving and storage offers clients a secure clean environment. Maidmans offer document storage and archive facilities to business users throughout Bournemouth, Poole and the whole of Dorset. You may wish to use the facility for long term storage or regular access to your files and documents. as your business needs grow our facility will accommodate your requirements. • Genuine cost-effective savings on office space. • Secure, dry and clean storage facilities. • Rapid retrieval of your valuable data. Document storage and archive is provided from a huge, secure warehouse. So it can grow as your business grows. With all the trusted back up of the Maidmans team. Maidmans can supply you with specialist strong archive boxes for long term storage and use. A cost effective solution, so you can use space more effectively! Why look anywhere else? We have storage space at great value and for as long as you need! We’re great value for confidential shredding. Why let unwanted paperwork get in the way? Relocating your business means recycling or disposing of surplus equipment and waste before you move. The less to pack, the less to move and unpack – meaning less disruption to your business. Comply with complex regulations such as the Hazardous Waste Directive or WEEE (Waste Electrical and Electronic Equipment) Directive. The Data Protection Act 1988 places the responsibility for the storage security and disposal of all paper based data. Maidmans Shredding services offer peace of mind when the time come to destroy documents. For more information visit our Secure Shredding page. For all of your storage needs you can trust Maidmans.